In 1990, lifelong enthusiast and college and professional golf player George Kelley wondered if there was an opportunity for him to open a golf course on his family's farmland located between Merced and Modesto, two areas of California's Central Valley that had been identified as having a dearth of places to tee off. Driving through the property, which has been in the family since the mid-1800s, Kelley came across about 1,000 acres of pristine pasture often used for grazing cattle, nestled between two major rivers and home to about 150 acres of wetlands. "Because I had been around golf my whole life and studied golf architecture, the minute I saw this piece of land I knew there was an opportunity to do something special out here," said Kelley, who was at the time working as a commercial realtor in the San Francisco Bay Area and specializing in golf-related ventures. And so Kelley convinced former San Francisco Giants owner and family friend Bob Lurie to front him the money. He then set out to find a course architect who was young, in need of their big break and who would let Kelley also try his hand at designing a fun and challenging course. In September of 1995, the Stevinson Ranch Golf Club, nicknamed "The Jewel Of The Valley," opened its doors and 18 holes. Soon after, praise began to pour in for its throwback design recalling some of the great Scottish courses. It was voted fifth best public course in the country by readers of Golf World magazine. A recent issue of Links magazine rated it among the world's top 10 courses worth discovering. The Stevinson Ranch Golf Club was mostly green when this shot was taken in the summer of 2012, although big brown patches had begun to show up. This year the brown spots grew and the water to defend the remaining green became more expensive, leaving the historic course with only one economic option: to shut down. Photo by Lisa Suender, courtesy of Flickr. Stevinson Ranch faced challenges over the years. In 2013, a fire destroyed the pro shop, restaurant and kitchen and microscopic worms that feed on plants nearly destroyed the course's putting surfaces. Like many golf courses across the country, Stevinson Ranch was also seeing a decrease in players coming through the door -- from about 44,000 at its peak down to 30,000 annually. But ultimately, it wasn't worms, fires or declining foot traffic that forced Stevinson Ranch to close its gates Saturday. It was a record drought. For the first time in 125 years, Kelley said the 26-mile canal that traverses the course and brings water from the Sierra Nevada Mountains to the ranch ran completely dry. They dug wells, but that only brought in about half of the water needed to irrigate the golf course and it was expensive, he said. Big brown spots began popping up on the fairways, affecting the course experience. "It was the straw that broke the camel's back," Kelley said. "Obviously we were having some economic issues too, but we just decided that we can't keep sustaining this. Basically it was a business decision -- do we allocate what water we have to almonds, which is profitable, or to golf that isn't?" Across the state, California's about 900 golf courses are feeling the effects of the state's historic drought. Being in the business of keeping huge swaths of grass green, while everyday residents haul leftover bathwater to soak their vegetable gardens, can make managing a golf course a challenging job. Around California, courses are trying to adapt -- building off better practices already years in the making as well as using new technologies to keep California golf a viable $6 billion industry. Before the most recent drought took hold, in 2009, then-Gov. Arnold Schwarzenegger (R) signed seven bills that created a comprehensive plan to reduce water use in California 20 percent by 2020. In Southern California, where golf courses are especially abundant, the golf industry saw the writing on the wall and worked with the municipal water utility, the Los Angeles Department of Water and Power (LADWP), to create flexibility for water at courses while also cutting consumption. Those standards laid the groundwork for industry groups like the California Golf Course Superintendents Association and others to create strategies that courses could share and borrow to make voluntary cutbacks and encourage conservation, said Jim Ferrin, a government relations representative with the California Golf Course Superintendents Association. In May, state regulators ordered a 25 percent mandatory cut in the use of drinkable water in California and gave local water agencies the jurisdiction to decide how to achieve it. Golf courses that use potable water are seeing cuts in their water allocations, tough sprinkler restrictions and in some places higher water rates. Gov. Jerry Brown (D) specifically called out golf courses, too. And some water utilities are asking for even deeper cuts. In the Bay Area, for example, the East Bay Municipal Utility District has called for a 40 percent reduction in potable water use. The golf industry has long been aware that they are big water resource users and could do better, Ferrin said. Last year, when it became clear the drought wasn't going anywhere, many course superintendents began to worry. "Historically, drought had only gone every three years," he said. "That's variable obviously in terms of which region your course is located, but we've never gone a cycle that's lasted more than really three years of any sort of substance." An average 18-hole golf course covers close to 120 acres and uses almost 90 million gallons of water per year, enough to fill 136 Olympic-size swimming pools, according to some estimates. That's not insignificant, but to put it in perspective, golf courses use less than 1 percent of the fresh water in the state, while homes, businesses and industry use roughly 20 percent, according to the U.S. Geological Survey. Farmers, by comparison, use nearly 80 percent. Reducing water use isn't a big ask for most courses, Ferrin said, the challenge comes when managers are told how to do it. "When we're told to cut 20-25 percent and you can only water Tuesdays and Saturdays, that's when it hurts," he said. "Our golf greens are cut really low and they can get drought-y after one hot day." As many Californians watch their lawns wither and die, vibrant green golf courses are often vilified, but Ferrin said what most people don't realize is that keeping the grounds green is akin to a highly controlled science experiment. The California Golf Course Superintendents Association has a list of strategies courses can use to cut their water use. To begin, courses need to look at what type of turf they have planted and where it can be reduced and not affect play. Today, courses have more drought-resistant types of grass to choose from than ever before, Ferrin said. Modern sprinkler systems are not only automated, but each head can be individually controlled for precise watering and the California Golf Course Superintendents Association estimates about 75 percent of California courses have at least some of these installed. Many courses have their own weather stations, which allow superintendents to calculate exactly how much water needs to be used. Moisture meters, wetting agents and aerating soil are other tools managers have to stretch their water budgets. "It's a scientific applied way that we go about using water," he said. "It's really not just throw down a little fertilizer and water on the lawn." But not all courses have the money to invest in big technology upgrades, or even basic infrastructure ones. 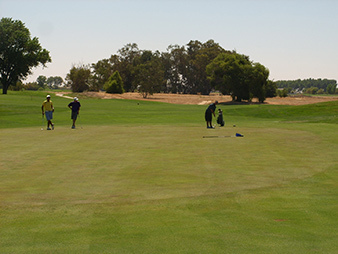 Located in Woodland, Calif., about 30 miles northwest of Sacramento, the Yolo Fliers Club has been a destination for golfers since the club was founded almost 100 years ago. To maintain the Bermuda grass fairways lined with giant valley oaks while also hitting mandatory water restrictions is a balancing act, said Kurt Vogel, the private club's manager. "Every golf course wants to provide best course conditions to make them stand out. Generally speaking, that requires water," he said. "In this area we're all reeling, but to turn every ounce of water off in lieu of the drought, we're not going to do that unless we're told to. We're not going to get crazy drastic with our cutbacks." This spring, the Yolo Fliers Club created a drought plan to show its members how it intends to comply with statewide conservation goals and do its part for the environment. Water pump malfunctions in 2013 forced the course to use about 50 percent less water than they were using previously, "a test and we passed," Vogel said, so the club already has some tested ideas on how to cut water use as the drought rages on. The priority for any course is to maintain good turf -- that is lawns that are firm, green and allow the ball to roll -- where golfers are putting. "Certain places like our driving range, the majority of that space where you practice golf -- the area you're hitting them into a big field with targets -- we can remove those areas of the property from really irrigating them," he said. "That buys us about 4 or 5 acres of non-irrigated grounds." Many courses in Southern California are getting rebates, between $2 to $3 a square foot to tear out turf. The LADWP pays $1 per square foot for the first 10,000 of a commercial project, and 50 cents for additional square feet, up to an acre. Of the Metropolitan Water District of Southern California's $85.6 million turf replacement program, about 60 percent can be used by commercial customers, including golf courses. But the same old-world charm that gives the Yolo Fliers Club its appeal also means some reduction methods aren't good fits. For example, Vogel said they could put in more drought-tolerant grass, but in addition to it being expensive, the course is built on hard, clay soil, which Vogel says is terrible for growing grass, so a new species may flounder. The course's irrigation system is about 50 years old and has some leaks, but it would also be expensive to replace. In addition, the club wants to keep the huge oak trees on the property healthy. "We pay attention to what other people are doing, but there are differences between one piece of property and the design and layout of the course," he said. "If this [drought] continues, it could mean turning the water off on trees by the holes. That's really hurting the aesthetic beauty and keeps us from bringing in new members." Vogel said looking to the future he's not sure what the modern golf course might look like but hopes the industry will get better at explaining the process for keeping the greens green, because, he said, "you can't play golf on concrete." We may not be seeing concrete greens anytime soon, but if the industry is going to survive in California, Ferrin said, he does expect the golf course of the future to look a little different. First, courses will probably be smaller. For the average 18-hole, 120-acre course, Ferrin said he expects between 25-40 percent of the turf to be replaced with drought-resistant or native plants, or more of what he calls the "desert look." He also thinks golfers will be more forgiving of less-than-perfect greens and have a better understanding of the micromanaging and technology that is required to create a solid putting experience. Citing the boom of course installations in the 1990s and 2000s in California, he said some courses will close. "The demand has tapped off," he explained. "Unfortunately some, too, will fall by the wayside because of the cost of water." As far as water goes, Kelley said even if the rain pours down next year, he thinks golf course superintendents fundamentally understand that wall-to-wall, lush green courses are a thing of the past in California. "You travel the world playing golf and you see a lot more brown," he said. "We think if the golf course isn't verdant green there's something wrong with it. I call it the "Augusta effect," where they play the Masters. That's just not normal, healthy or good. It requires a huge amount of money, chemicals, water and fungicides." Also, expect to see the use of recycled water become the norm rather than the exception, both men said. Currently, more than a third of the state's courses are hooked up to recycled water. If they cannot get a direct line, Ferrin added that he thinks water utilities will invest substations so recycled water can be pumped to isolated locations. "I also think we're going to be headed toward being mandated that if you have an opportunity to use treated water you're going to be mandated to use that," Kelley said. "I think it's an absolute tragedy that golf courses use potable water." Then he added, "Even if next year is a wet year, we can't take water for granted anymore."